With a stage presence that has been called “joyously uninhibited” (Opera Canada), soprano Jennifer Krabbe is finding success on both the operatic and the concert stage. In the fall of 2014, Jennifer was the winner of the prestigious Jim and Charlotte Norcop Prize in Song, and as a result presented the Winner’s Song Recital at the University of Toronto to great acclaim. Other awards include the David and Marcia Beach Award, as well as an honorable mention in the Ottawa Choral Society’s New Discoveries Auditions for Young Artists. Some of Jennifer’s recent operatic roles include Pamina in a new English production of Mozart’s The Magic Flute at the Stratford Summer Music Festival and the Indian River Music Festival, Calisto in Cavalli’s La Calisto, Dido in Purcell’s Dido and Aeneas, Virtu and Drusilla in Monteverdi’s L’incoronazione di Poppea, and Taumännchen and Sandmännchen in Humperdinck’s Hansel und Gretel. On the concert stage, Jennifer has performed a wide variety music. 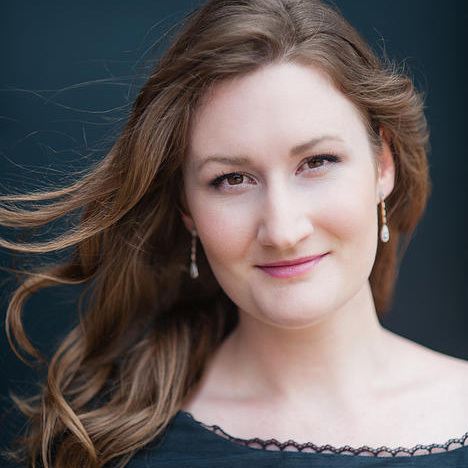 As a Sidgwick Scholar with the Orpheus Choir of Toronto she appeared as as soloist in the Canadian premiere of Benjamin Britten’s The World of the Spirit, Larry Nickel’s Requiem for Peace, Eriks Ešenvalds’ Passion and Resurrection, and Howard Goodall’s Every Purpose Under Heaven. Other concert performances include Haydn’s Lord Nelson Mass, Mozart’s Vespere solennes de confessore and Exultate Jubilate, Handel’s Messiah, Vivaldi’s Gloria, Saint-Saëns’ Oratorio de Noël, Vaughan Williams’ Serenade to Music, Charpentier’s Messe des Morts, and Fauré’s Requiem. Jennifer is a founding member of Collectìf, a collective of musicians dedicated to exploring and expanding the world of art song performance by presenting innovative, song-based theatre. A graduate of both the University of Western Ontario, and the Royal Conservatory’s Glenn Gould School, Jennifer recently completed her Master’s degree in Voice Performance at the University of Toronto under the tutelage of soprano, Monica Whicher.